Our business is built on satisfied customer referrals - Call the Crackman for mobile concrete crack repairs and concrete driveway refinishing. Since June of 2006, we have used the services of Gaynes The Crackman for Slab Jacking our walkways and driveway, Crack Repairs and the Washing and Custom Colour Sealing of our driveway. We are very pleased with the unique look this gives our property, for the friendly and professional service that we have consistently experienced over the years. 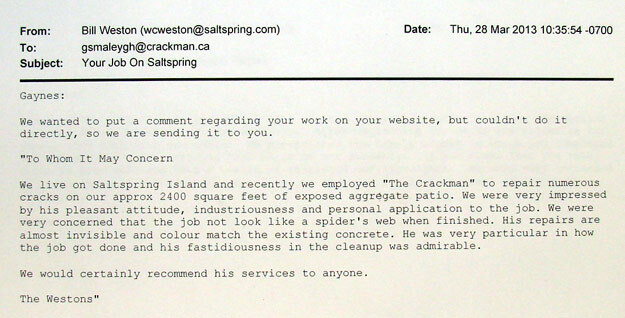 We are more than happy to recommend The Crackman for any of your concrete related issues.